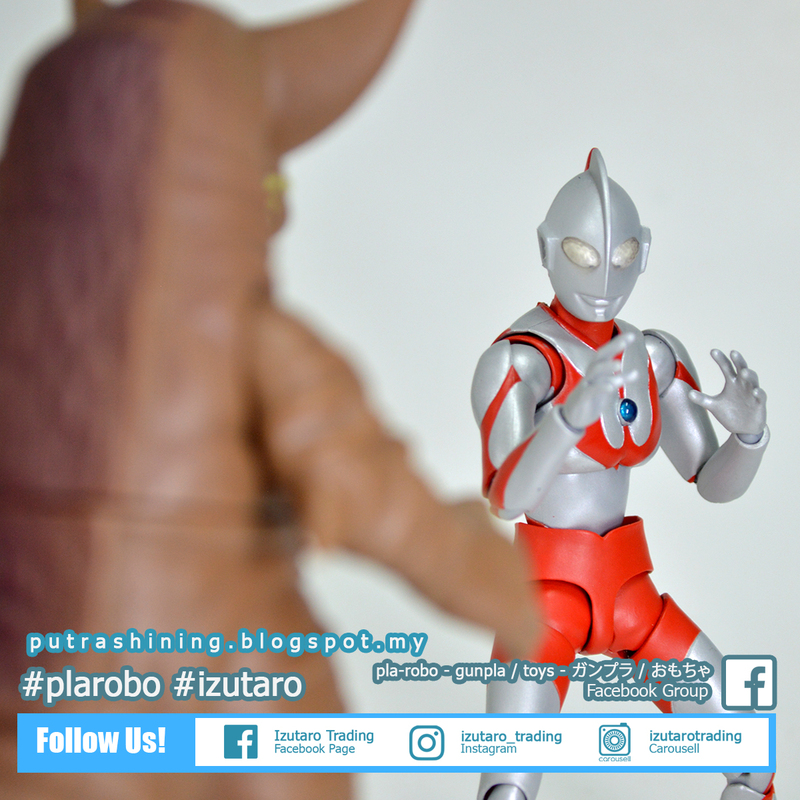 Welcome to Putaro Plastic Modeller! 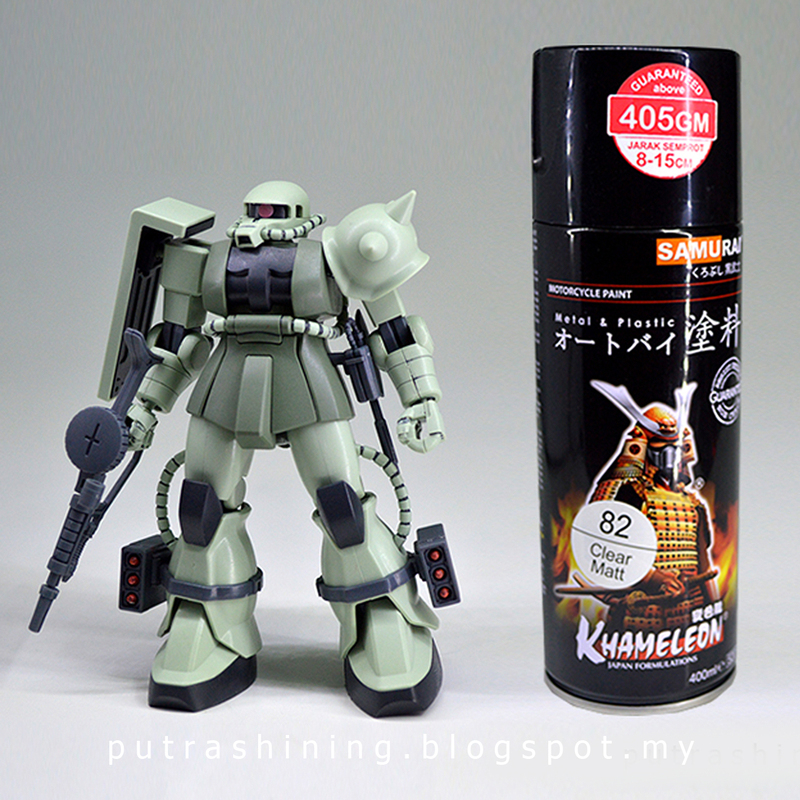 This time i post a simple tutorial about top coat for gunpla. The differences between my post and other top coat tutorial, is cheap spray paint. 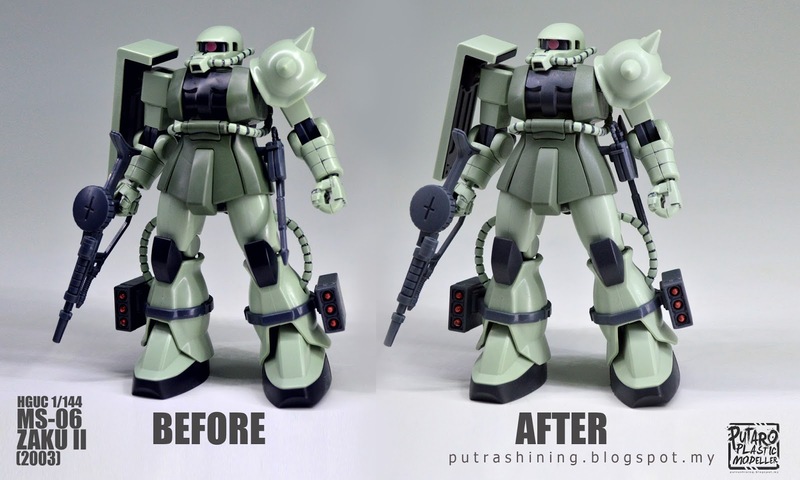 Usually we used the proper top coat spray, the expensive product for model kit from Japan. But time time i show you that some hack for gunpla. In Malaysia this product is popular among beginner gunpla builder like me. This top coat is not as good like the expensive top coat for gunpla but it can help you achieved the similar proper top coat should looks like. I hope this simple tutorial can help the beginners like me. I like to explore new techniques, items, and tools for building gunpla. My background as Fine Artist show me that we can build/paint anything from anything, just need to explore and understand the subject and we can build it. 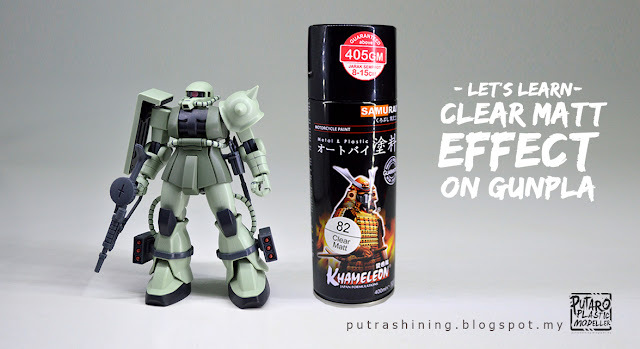 From this tutorial you will learn the effects of Clear Matt top coat on gunpla, the differences between Samurai Pant's Top Coats, the suitable top coat for your gunpla and the relevant of choosing this top coat. In this tutorial, i used Samurai Paint. 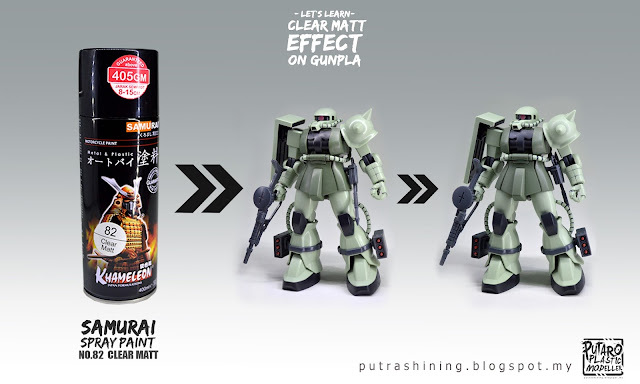 Since i build gunpla, i usually used Samurai Paint's spray. I've been testing lots of samurai's color and other spray paint too. For the moment this two is my favorite product. Almost every gunpla in this blog that i build is top coated from either this two top coat. 1) Samurai Spray Paint No.82 Clear Matt. 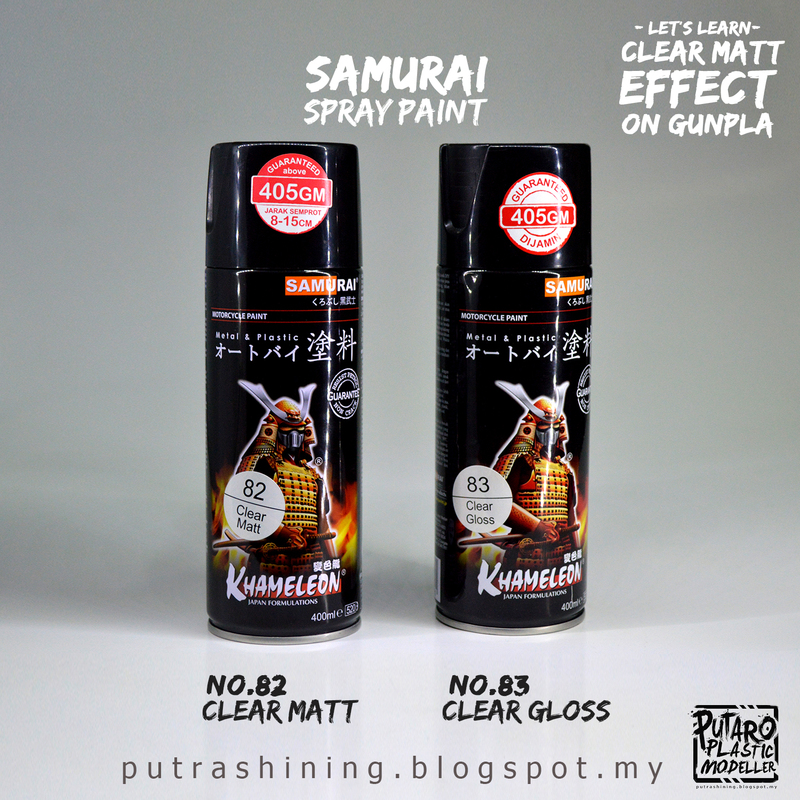 2) Samurai Spray Paint No.83 Clear Gloss. These two top coat have very different effects. Each top coat have their own speciality. Some people like their model kit looks matte because it looks clean and expensive. Some people like their model kit looks shiny and glimmer. For me, i like both but not to matte, not too shiny. As long my gunpla do not look like a toy. Some people will get confused with the Clear Matt, and Flat Clear. It's a different thing and have different effect. Flat Clear effect will be much clean look but easy to get scratched. Clear Matt in other hand is much rough texture and suitable for weathering effect. As you can see the texture on the SD Ex-standard Astray Red Frame, it's suitable for weathering effect. If you apply the Clear Matt before you weathering it, the weathering effect will be easily to apply and effectively. 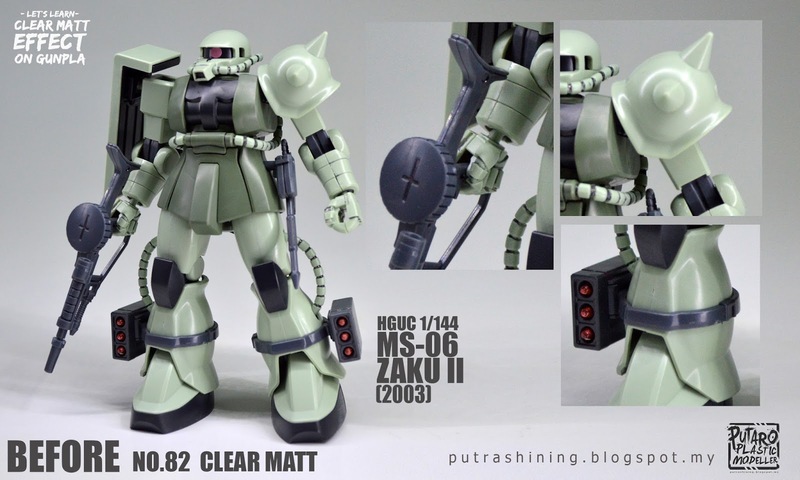 The speciality of Clear Matt is, it can covers a bit of the scratch and nub marks on your model kit. (if you applied it in the right way) Spray your gunpla from distance 8-15cm. You can apply for 2-3 layers. For the Clear Gloss, it's metal like effect. (Next time i'll show you the differences). 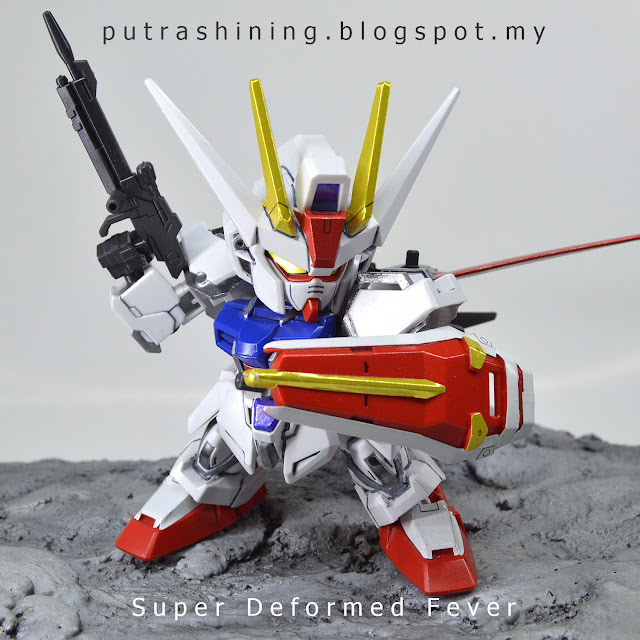 Clear Gloss is suitable for metal like finish, like SD Gundam Ex-standards. The speciality about Clear Gloss is when you apply to white model kit or gunpla that have metallic stickers/decal, the stickers/decal will blend in. (if you applied it in the right way) Spray your gunpla from distance 8-15cm. You can apply for 2-3 layers. You can find SAMURAI PAINT from the info below. 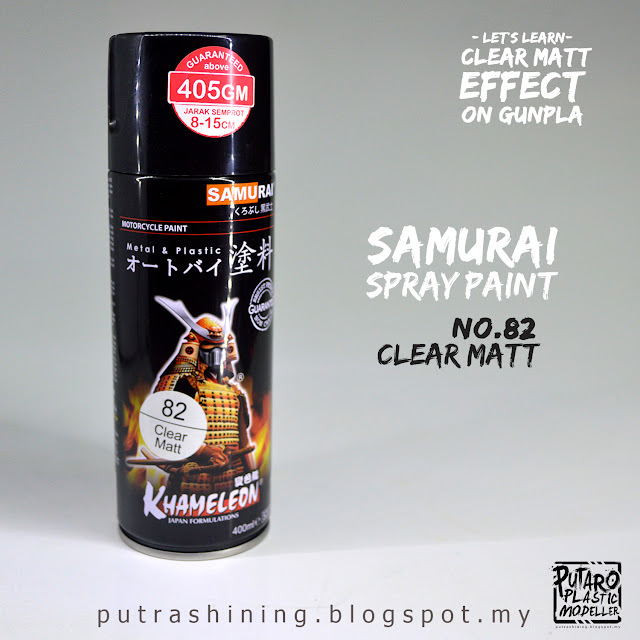 I believe that Samurai Spray Paint is also available in Thailand and Singapore too. I'm not sure about other country. 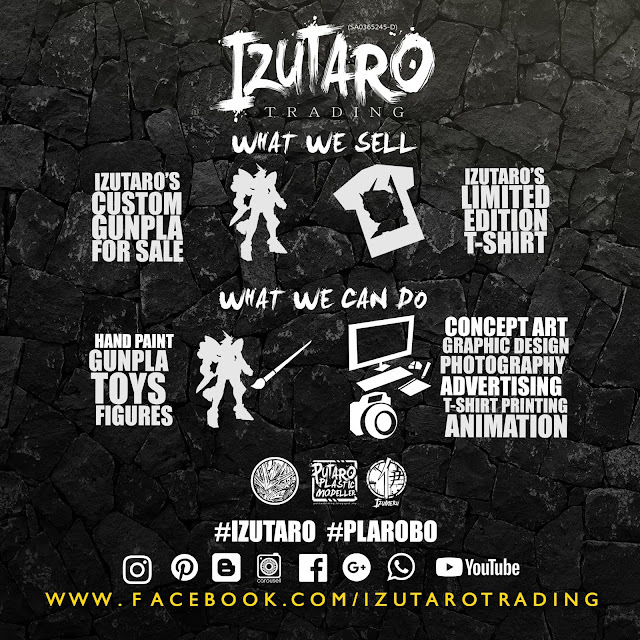 (MY) SAMURAI PAINT (MALAYSIA) SDN BHD, 4-3, Jalan Medan Putra 4, Meda Putra 4, Medan Putra Business Centre, Bandar Menjalara, Kepong, 52200 Kuala Lumpur, MALAYSIA. Tel: +603 6274 4903. (ID) PT SAMURAI PAINT, Jl Sunter Mas Utara, Blok H1 no 17J, Jakarta Utara, 14350 INDONESIA. Tel: +62 21 6530 0624. For this tutorial, i used SAMURAI's No.82 Clear Matt. I usually applied the top coat 2-3 layers. Usually you can find it on local hardware store. For this tutorial, the gunpla i used is the 2003 HGUC 1/144 MS-06 ZAKU II. I choose this kit because it's an old kit and the nub marks is visible. Other than that this kit is on of the icon of zeon. 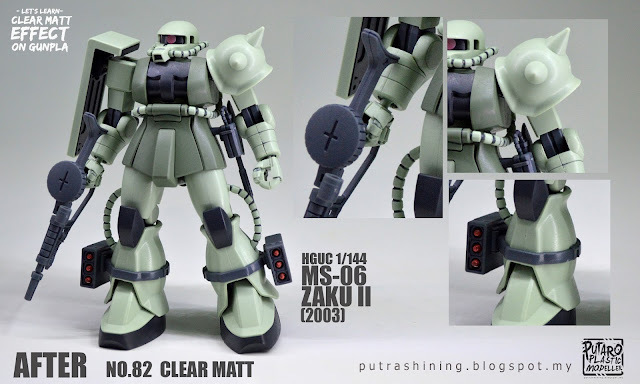 The MS-06 Zaku II is a line of mobile suits from the Universal Century timeline. It was developed from the earlier MS-05 Zaku I line, and appears in Mobile Suit Gundam. The MS-06 Zaku II series was one of the most produced and versatile mobile suits of the One Year War. And even after its performance was surpassed by its successor mobile suits, like the MS-07B Gouf, the MS-09B Dom, and the MS-14A Gelgoog, it would still see wide-scale service both on the front lines and behind the scenes after the war's end. 1. Clear the surface of your gunpla. 2. Shake the spray can for 30 seconds. Aim the gunpla from distance 8-15cm and spray sideways. DO NOT spray at one spot. 3. Let it dry for 2-5 minutes and repeat for 2-3 times. 4. Apply all side of your gunpla. As you can see the difference before and after the Top Coat Clear Matt applied, even the color is changed, this is because the texture. This is before the Clear Matt apply, you can see the nub marks clearly, and the kit looks plastic/toy like. This is the look of final product after applied the Clear Matt, you can see the nub marks almost gone. I applied top coat with 3 thin layers. If you apply it more than 5 layers, it will look like the expensive top coat for model kit. That is why i like this top coat, because i can control the volume of thickness that i desire. This will help you to see it more clearly. 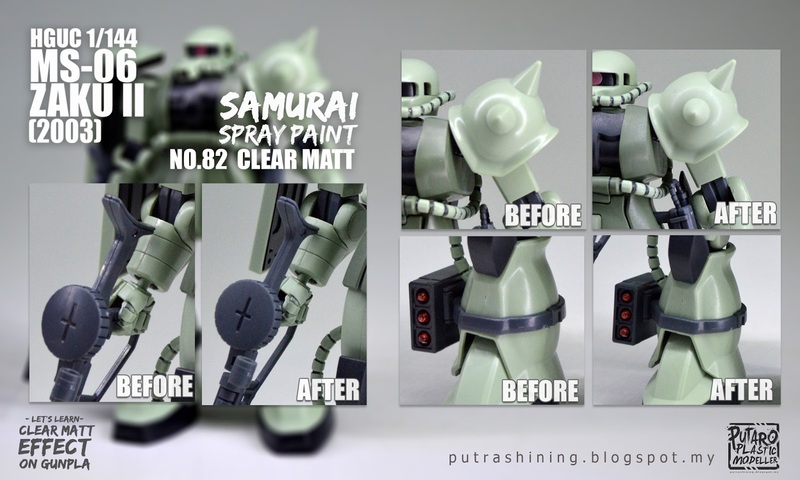 For one Samurai Spray Paint Clear Matt can used minimum for 4 Normal Size High Grade gunpla. Usually i can used up to 6-10 HG if you apply it with 2 layers. For builders that like to explore things, you should try this. 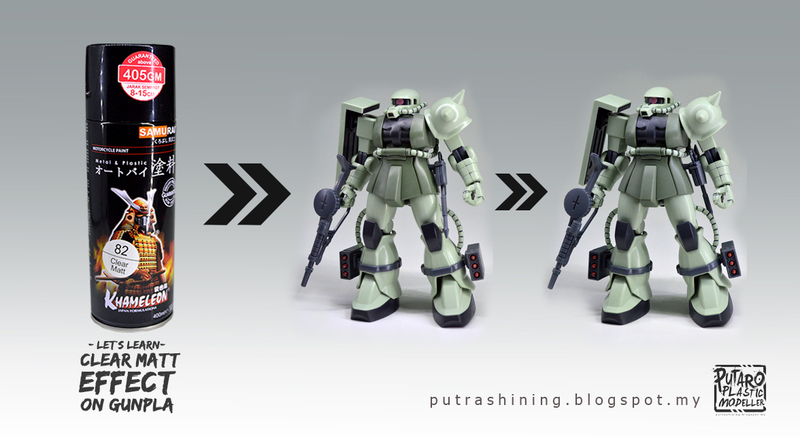 For those who seek for cheapest way to enjoy your gunpla, you can use this tutorial. 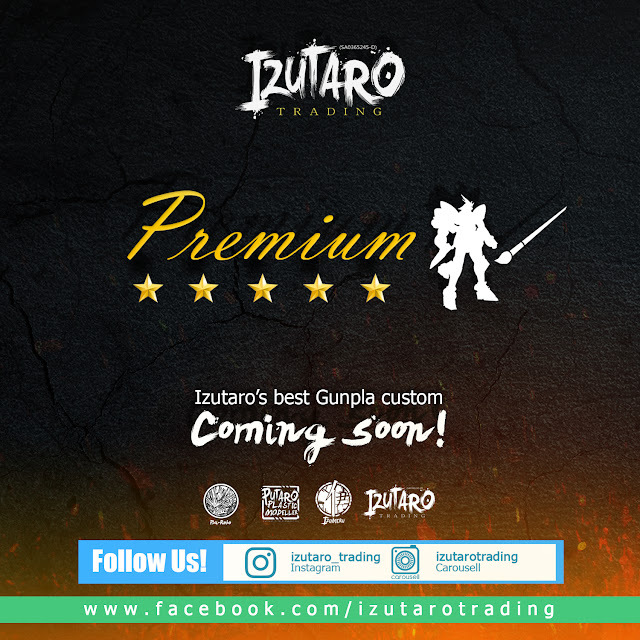 It's your choice decide which one is good and suitable for your gunpla, i am here just sharing what i choose, like, and used. I hope this simple tutorial can help you guys especially for the beginners. 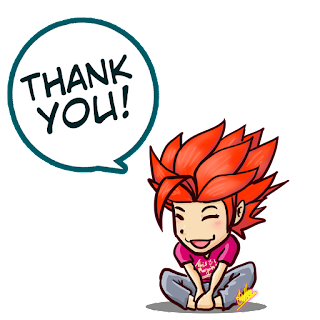 Thank you for viewing Putaro Plastic Modeller.